Controversy over 2nd Mighty No. 9 Funding Campaign? It’s generating quite a bit of excitement, and as the developers realize that this game has a large and dedicated following, they decided to capitalize on it. More details about the announcement are at the Mighty No. 9 website, but the general idea is that the original funding is enough to make the game and it will still be made, but this new campaign is to fund bonus content. The first announced stretch goal is full English voice acting. Apparently some people are outraged about this second campaign. People are complaining that producer Keiji Inafune is greedy. “You’ve already got $4 million, and now you want even more money? !” Some people have compared it to Exploding Rabbit’s Super Retro Squad, which met its very conservative funding goal easily, yet the developers were inexperienced and realized during its development that making games is hard. But Mighty No. 9 is getting made. The people behind it know what they are doing and are fully-funded. The new campaign isn’t to help finish the game. It’s to add more bonus content to the game. 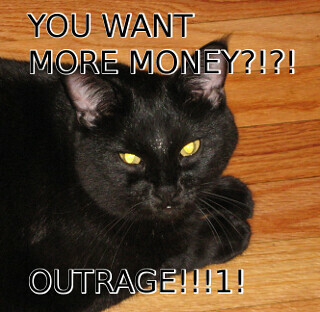 There is a very strange entitlement issue that some vocal Internet denizens seem to share. Kickstarter is a way to invest in something, and it’s entirely possible that it will fail. You contributing $5 or $500 does not mean you will get what is being made. A project may also turn out completely different than originally planned. And when Mighty No. 9 is looking like it is well on its way to being exactly as advertised, the hostility lobbed at the developers for what some people misunderstand as greed is even more bizarre. Making games in full view of the public is like being an umpire at a Little League baseball game in which all of the parents watching are drunk and boisterous and occasionally violent. Oh, and they don’t know how the game is played, yet have no trouble telling you how you are doing a terrible job in very colorful language. Is it just business, though? Are people merely getting insight into what it is really like, now that funding is crowd-sourced? Or is it the nature of business on the Internet? I imagine Bill Gates long ago learned to put a filter on the content he reads to keep his sanity. It’s hard to keep your finger on the pulse of the industry if you are going to read about how you are the Devil incarnate on a regular basis. I suppose before the Internet you just had to worry about a harsh opinion piece in the newspaper because most publicly-available forums were professional in nature. Being an indie developer has appeal for many partly because you are not beholden to someone else. You have no boss but yourself. You have no constraints on your vision but your own. You have no deadlines but the ones you impose. Yet, crowd-sourced funding puts you in this strange place. It enables you to not only do market research and connect with fans, but it can also give those fans a sense of ownership in your independent venture. And if the expectations aren’t clear upfront, there can be a lot of pain.